The Canary All-in-One Home Security System remains one of my favorite home security cameras. Abilities such as temperature and humidity monitoring make this more than a simple home security camera. Add in some free cloud storage and an audible alarm and you can begin to see this is more than your basic camera. The recently announced Canary and Wink integration allows for a bunch of additional enhancements that go beyond home surveillance. Now we’re talking home automation. Those unfamiliar with a Canary Home Security System can read more about it in our Canary product review. What’s Wink? There are two components. First, we have the Wink Connected Home Hub. This is an automation router for components such as the GE Link Smart LED Light Bulb. The bulb connected to the hub can be automatically controlled by time of day or a connected smartphone. The second Wink component is the app which ties all of this hardware together. Our discussion will center around the app. The Wink application also supports products made by other companies. The Canary Home Security System is one of those products. To use Canary and Wink, you will download the Wink app to your smartphone. In Wink terms, the Canary camera is called a product. Add the Canary through the product dialogue. Now establish a Wink shortcut. A shortcut is a scenario that you want to occur. A typical shortcut would be arm Canary and another to disarm Canary. Lastly, a robot tie together a product event with an action. So why would you want to use Canary and Wink? For automation triggered by events that only Canary can detect. Want an example of a simple Wink robot? Send yourself an email when someone that’s known to Canary enters your home for greater than 15 minutes. The Wink robot can facilitate this. You don’t need the Wink Connected Home Hub or any additional hardware to do this. 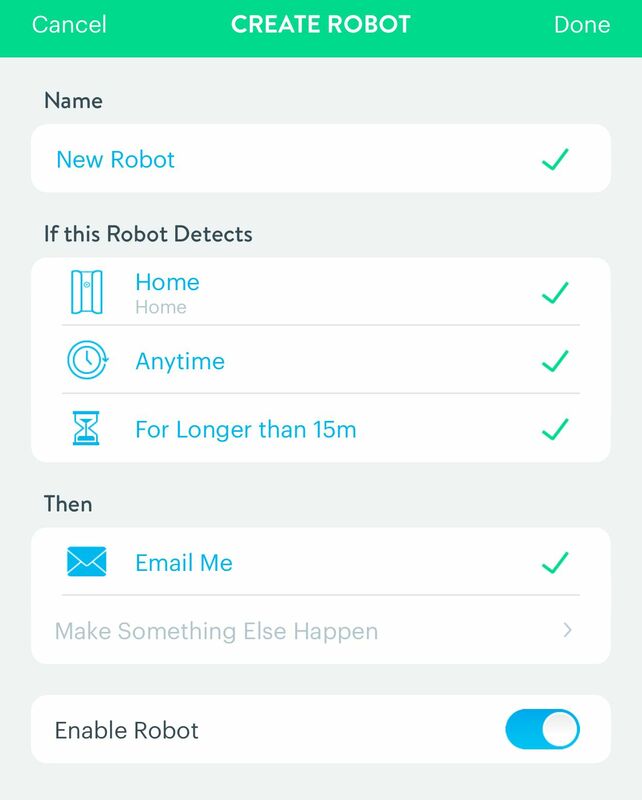 Another common robot is to establish a schedule to override your default privacy mode settings. The Wink robot will take precedence over what’s programmed into your Canary. So if you want to turn on your Canary during a time when you would typically have it set to private, simply setup a Wink robot to do that. A bit more complex robot example requires use of the Wink Connected Home Hub. If you enter your home, automatically turn some lights on. That’s a simple robot to create. The integration of Canary and Wink provides access to one of my favorite automation services. It’s called IFTTT. Canary does not support IFTTT. Wink fully supports it. This means that once your Canary Home Security System is integrated with the Wink app, you now have access to IFTTT. To use IFTTT with Canary, first establish Wink shortcuts to arm, disarm, and set Canary to privacy mode. Use the Wink channel in IFTTT to create some recipes. After doing that, you can automatically change the Canary mode based upon events like the weather, your door unlocking or even by using the Amazon Echo. Hopefully this integration represents an important step towards a fuller automation suite. Automation based upon motion detection would be a nice feature to have. Turning on my lights whenever there’s unexpected motion in a room would be a great deterrent to use.